"'A shocking vision of our future that is one part Minority Report and one part Chinatown. But the Golden State is far less a paradise than its name might suggest. To monitor, verify, and enforce the Objectively So requires a veritable panopticon of surveillance, recording, and record-keeping. And when those in control of the truth twist it for nefarious means, the Speculators may be the only ones with the power to fight back." I am sincerely sad to say that this book was a huge disappointment for me. If we're being honest, I'm not entirely sure I understand all of what I just read and it definitely not in a good way. 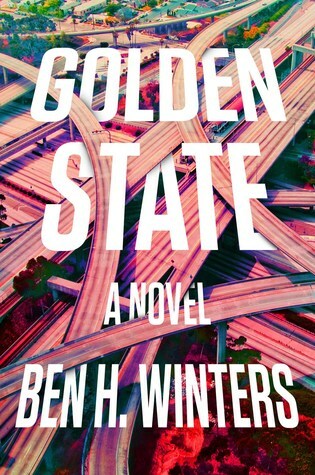 Golden State started out promising enough with a thought-provoking and expansive dystopian idea, but after about the halfway mark something went a little haywire and the entire plot thread started to unravel in incoherent and confusing ways. But let's start back at the beginning, shall we? Golden State started out with a page-turning opener that gave me high hopes. Information about the world was sparse, but I just assumed Winters' style was going to be of the 'slow reveal' variety. We're introduced to the two main protagonists, Laszlo and Aysa, fairly early on, Laszlo being a more unlikable character and Aysa being someone that the reader could really come to root for. There were small problems in this first half concerning too fast pacing and not properly setting the scene for the world we're exploring, but things still mostly worked. The story was still enjoyable, and I could attribute the lack of explanation about the world to it being a first person narration from Laszo who things we, the readers, already know what's going on. Unfortunately, more of the world was not introduced. And look, I get that the background for the Golden State is supposed to be unknown to some of the inhabitants too, but it didn't work for me. In order for me to really get on board with dystopian novels, I need some explanation on the 'how' and 'why' the world got to where it was, and as mentioned above, that was never fully explained. Winters seemed too eager to tell his story and therefore pushed things forward too quickly without enough expansion into the world and allowing the reader to fully follow it. I was waiting the entire book to finally have some moment of enlightenment where I would realize what I was missing--I already knew this wasn't going to be a five-star book, but I thought maybe it would redeem itself and be at least a high three or four. That didn't happen. The only potentially redeeming factor of this book was with the characters and the overarching themes of the book. Although our protagonist Laszlo wasn't the nicest person, I held some respect for him and was curious to see where his character arc would go. I also though Aysa was a fascinating person who would bring a lot to the story since she was such a foil to Laszlo and had extra skill. Because of this, I was extra frustrated with the lack of world-building and coherent plot. As mentioned, once the novel hit the halfway mark things went downhill quickly. I was already getting weary, frustrated, and confused in events leading up to one of the bigger plot twists, and then when it happened, I was lost. From that point, it was a struggle to finish this book. There were so many things I didn't follow and the characters lost much of the potential multi-dimensional aspects that they had; things just didn't move in a clear manner. There seemed to be a lot of things left for the reader to infer, and I just didn't get them. One of my biggest peeves, though, was something that's a bit of a spoiler, so I'm including it here under a spoiler tag (only highlight if you have read the book and/or don't mind being spoiled):I was so upset that Winters killed off the best character that also had the most potential of any of them. Especially since it was for what seemed to me to be absolutely no reason at all. If characters are going to die, I need good reasons that affect the plot, and I get there Winters was going with this, but it mainly frustrated me. End spoiler. It's hard for me to rate this book because I really do love the concept of an attempt to keep absolute truths and eradicate 'untruths,' and I genuinely believe Winters has some great ideas to explore. A society attempting to prevent anyone from lying is a huge task and it was really interesting to see how this society attempted to do so (and, you know, a little creepy). Unfortunately, it was his execution that took away from those and left me feeling confused and unsure what to make of it all. If you want a dystopian novel with an interesting concept that's quick to get through, go ahead and pick up Golden State, but otherwise I'd perhaps advise you to pick up another dystopian to fill that niche. I've seen some people really love this book, and I'm really happy to see that it clicked with other people, but it just did not at all with me. Overall, I've given Golden State 2.75-3 stars. That cover is kinda freaky, imagine driving on that. Anyway! I love Dystopian books, they're some of my favorite. But I've also noticed that they're either hit or miss. I might have to check this one out though. Great review. I'd be super interested to hear your thoughts--I hope you really enjoy it if you do read it! And I agree, those highways in the cover are a bit too crazy, haha. I'm sorry to hear this book didn't work out for me. I think many of the things you mentioned would bother me as well. I hope your next read is much better. Sorry this one was disappointing! I remember seeing it around a few times and being curious, but I'm not sure I'd love it either. Thanks for a great review! It definitely had a lot of hype behind it! I'm hoping others like it more than I did, haha. I'm sorry this was a disappointment! I agree, in dystopians the world-building needs to be good!